Edible Magazine: Edible Manhattan, San Francisco, Austin, Chicago, Brooklyn, Seattle, just to name a few. Then there is Edible Boston. I have lived by it, and have studied it, for the past few years. I first saw it in a restaurant in Boston. It was the Summer 2008 issue, with Heirloom tomatoes on front. I couldn’st believe it; a publication that was actually writing about local food companies, agriculture, farm to table restaurants, sustainability, herb gardens, organic chickens, and FOOD TRUCKS! I knew that this was something I wanted to be a part of, I just didn’st know how. 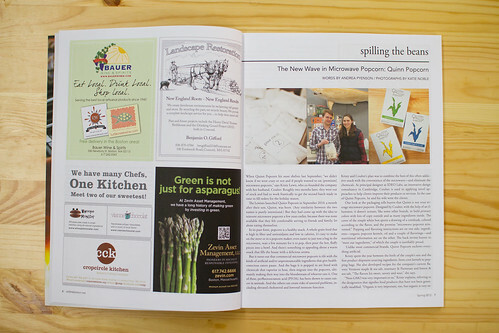 Since then, I always dreamed about being in Edible Boston. Way before Quinn Popcorn existed. (I am going to shamelessly say that..) I was drawn to it, the raw, yet journalistic style of photography, the vivid and candid food based articles. They are pretty much the backbone of the local and curated food community, and I hoped that one day my passion for food would bring me one step closer. If you were written up in Edible, then you pretty much had the seal of approval. You were doing all of the right things. I wanted to be accepted, I wanted their seal of approval. So, you can only imagine my feeling when one of the writers, Andrea Pyenson, reached out to us wanting to write an article, interested in what we were doing, in the food company that we were creating in one of Boston’ss suburbs. On top of that, the mini shock I received when Ilene Bezahler, the editor and publisher, called and let me know that we might be on the cover. It was the reality that my dream of living and breathing food was in fact not a fantasy anymore. I feel like we have just been accepted into Boston’ss food culture, which leaves me in smiles during most of the day. As we restock the shelves at Whole Foods and other markets in the area, I hope that others reading the article will reach out to us, and that we continue to build our brand within the city and towns that surround us. So, we continue to get great press. Food & Wine, Boston’ss Chronicle, Boston Globe, and a ton of bloggers have written about QP. It’ss one thing when we think we are doing something good, but it’ss another thing when others write about it, and think it too. This is the kind of fuel that keeps us going. PS. If you want to find out if your city has an Edible magaizne, click here. If they don’st, you might want to start one in your area!